Up with Cliff. Overcast, not cold. No precipitation. Wet. Goal was to set up two more bait sites selected by Cliff. These would be called Cliff 1 & 2. Cliff wanted to set them up in the Memaloose area. Went up the Memaloose. It's the first major turn off of Hwy. 224 going up to the mountains and is about 8 miles SE of Estacada. The place was trashed everywhere! Garbage of every description had been dumped every place! It was absolutely unbelievable! There were ruptured plastic bags of garbage, old construction materials, carpets, appliances - you name it, there was trash at every turn and certainly at every place a pickup truck could find two minutes of privacy. We went to a road Cliff had remembered. The Forest Service had bermed it so pickups couldn't get on it. We walked at least ½ mile one way. The alders were growing it shut in a couple of spots. Got to the end where he wanted to set up and more damn trash! I think Cliff is right about the Memaloose area. It's a good spot for the BHB's and a good spot for surveillance and baiting. It was heavily logged and there is a lot of different sizes of regrowth. You would just have to go to places that other people wouldn't get to very easily. Anyway, he decided we should go higher so we headed for the Three Lynx area. After much searching around we set one site up on the edge of a large meadow. Today, in addition to the Spam hanging, I had bought an orange Frisbee type disc that had a light in it. The light was a LED, so it should last a long time. In addition, I had bought two LED flasher lights at Radio Shack that bike riders wear. This was Cliff Site 1 and it was a good one. Mt. Mitchell was above us. There was a large beaver pond - actually a giant beaver pond in two levels on the far side of the meadow. There was a lot of grass and there were plenty of deer and elk tracks. On the side of the meadow where we set up the stuff, there was a small creek with no beaver dam, so it was probably seasonal. We had to walk in solid quarter of a mile at least to the meadow. Just out of sight of the road, I hung one flasher up in a tree on the old access road. There was a lot of moss on the ground, so I rather carefully pulled it back with the rake and raked a long area of dirt in hopes of getting tracks. Further along, a tall, slim tree had fallen and was across the road. We hung the Spam from the tree, right in the middle of the road at about 7' high. The aluminum pan showed good. On one edge of the meadow opening, we hung the lighted disc. I had duct taped some clear plastic over it to repel water. I had also duct taped the bike light seams to repel water. We knew this was not a good site for tracks, but we were curious if something would disturb the lures and baits. The soil was grassy and had lots of rocky material beneath it. The only place I could find to prepare the soil was by the flasher. Also on this trip, I had rigged up a piece of ½" pvc pipe so that we could just put the extensions together and with a little ½ cut T at the top, lay the fishing line in it an up it went, slick. Sometimes I amaze myself! Cheap too. Worked 90% better than trying to throw fishing weights with the line attached. I forgot the compact disc lures I had invented. They were great! Basically, they were two cd's on each end of an axle with a barrel swivel on a string off the axle. They picked up light and reflected beyond my hope. When I tested them at the house, they rotated in the slightest breeze and they did all the colors of the rainbow. I was very proud of them and they were home in the garage. Anyway, we went east toward Harriet Lake and found this side road that went up the hill. It wasn't really too driveable, so we walked up about ½ a mile and found some very mature regrowth on one side and some 40-50 year old stuff on the other side of the road. Nice variation. On the old side, there was very thick moss cover and we thought it would take impressions good, from what it did with our boots. 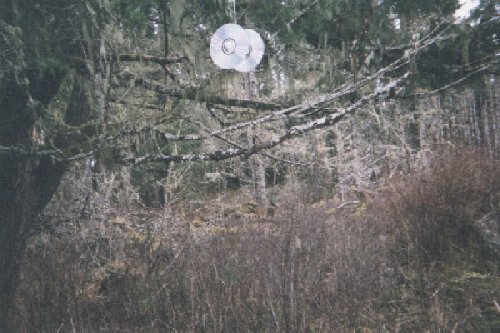 Set up a flasher right over the road and the Spam hanger off in the big trees. Cliff found a big pitch center in an old stump that had rotted completely out except for the pitchy center and the pitchy ring that the bark used to hang on. Called it "Squaw money" I think. Indians could barter with squaws with pitch like that. Makes a great fire starter. When I was a kid, we were always watching for pitch trees when we cut wood. After that, we went up by Frog Lake. Its a holding lake for the water coming off the mountain and going to the PGE powerhouse down below. Result is that it looks like a big rock/earth dam and is mowed all around. The water from the pipe boils up off to one side like a great spring 10 or more feet across. There is a good view of Indian Henry WSW across the valley and of Oak Grove Butte to the S.
I had brought my 4" spotting scope and set it up for Cliff to try. He was surprised by the power and the different views that the various eye pieces gave. I had a cheap ortho and 2 plossels along. I also had the barlow. He said that, when combined with the high powered plossel: "Really: sucked at his eyeball!" Anyway, he figured the scope would work good if we had the time and patience and a good spot. He was glad to hear you could take pictures with it. It started raining, so we went back. We were cold. It took a long time before we started to warm up. Roads: 224, 45/33/320 Memaloose then 4630, but short of Harriet Lake.